Frigant, V., & Miollan S. (2014). The geographical restructuring of the European automobile industry in the 2000s. MPRA Paper . Frigant, V., & Miollan S. (2014). 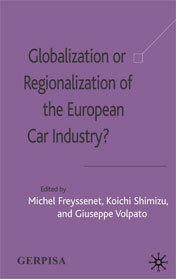 The Geographical Restructuring of the European Automobile Industry in the 2000s. MPRA Working Papers. Frigant, V. (2013). Une comparaison de l’internationalisation des chaînes d’approvisionnement automobiles allemande et française. Cahiers du GREThA. 32p. Frigant, V., & Talbot D. (2005). 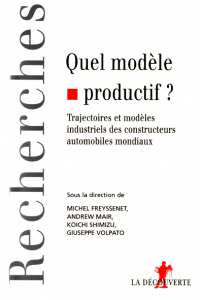 Technological Determinism and Modularity: Lessons from a Comparison between Aircraft and Auto Industries in Europe. Industry and innovation. 12(3), 337-355. Frigant, V. (2011). The three major uncertainties facing the European automotive industry. European Review of Industrial Economics and Policy. Egyptian pyramid or Aztec pyramid: How should we describe the industrial architecture of automotive supply chains in Europe? Frigant, V. (2011). Egyptian pyramid or Aztec pyramid: How should we describe the industrial architecture of automotive supply chains in Europe?. Cahiers du GREThA. Frigant, V. (2011). Egyptian pyramid or Aztec pyramid: what best represents the industrial architecture of automotive supply chains in Europe?. Gerpisa colloquium.